IS THE BEST ONE OF ALL TIME??? a) It’s the first time I’ve ever accepted a podcast invite. c) It was incredibly and surprisingly fun, and not awful to hear it played back. It seems poetic and lovely that the first podcast I join would be one talking about Harry Potter. For those of you who knew me for my first years of blogging, you already know I blogged under the name of PENSIEVE, a HP relic introduced in book four, The Goblet of Fire. 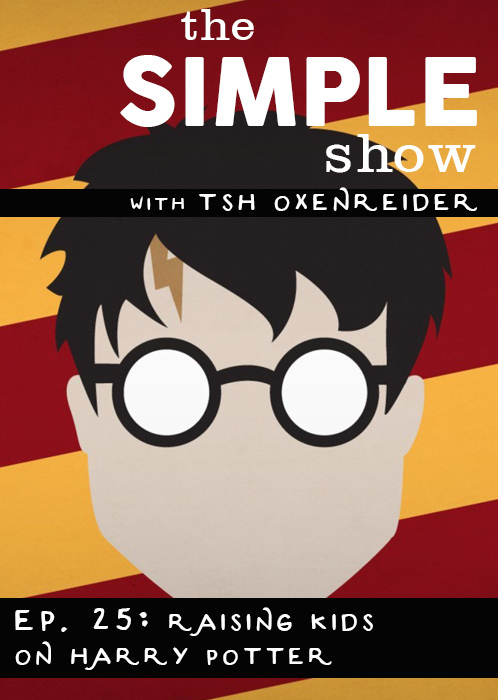 I truly hope you’ll check out The Simple Show’s 25th episode, “Raising Kids on Harry Potter” and tell me what you think. As long as you’re nice about it, you can even disagree with Cindy’s perspective. Otherwise, “if you can’t say anything nice, don’t say anything” should apply. Silence speaks volumes :). Your voice is perfect for podcasts–it s engaging and lovely to listen to!! You should do one of your own. I listen to podcasts on my computer all the time and your voice was sweet as honey! Ahhhh, Haylie, THANK YOU for popping over to let me know! It was SO fun chatting with Tsh (could you tell?). It’s always fun to share a kindred spirit, and when it comes to HP, I love it when people “get” what I’m saying. So nice to hear from you :). Hi Robin! I found your blog after listening to the Simple Show. I just read the first Harry Potter book after listening to you (I am 41!!) and I loved it! My daughter just started reading book 1 last night. Are there any resources you would recommend for discussing HP from a Christian perspective? I am an avid reader but dissecting literary themes without a guide is not in my bag of tricks at this point. Your point of view on the podcast was the impetus that finally pushed me over the hurdle, so thank you! Now off to book two! !